"Rise" is a new musical TV drama series headed to NBC this March, when it’s set to take over the "This is Us" time slot on Tuesdays at 9 p.m. 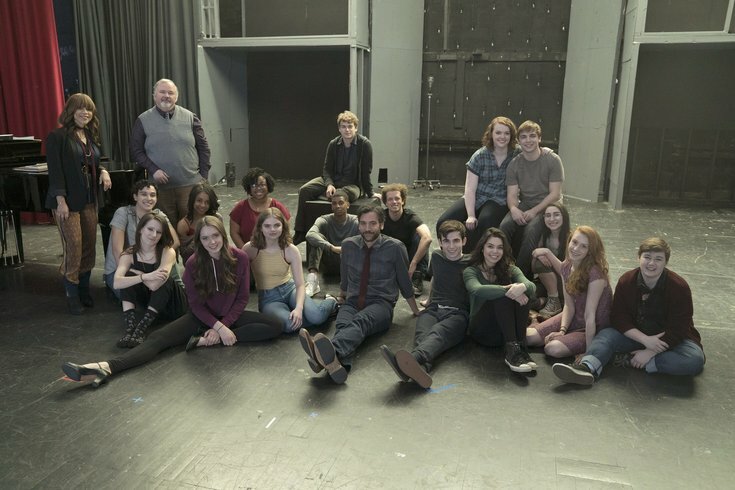 The show is loosely based on the acclaimed 2013 book, Drama High, by Levittown native and former Inquirer and Daily News reporter Michael Sokolove. The book told the story of the highly-regarded drama program at Harry S. Truman High School and its longtime teacher, Lou Volpe. The show has assembled quite a collection of talent, both in front of and behind the camera. It stars Josh Radnor (Ted from "How I Met Your Mother"), "Do the Right Thing" veteran Rosie Perez and Auli'i Cravalho, best known for voicing the main character and singing the songs in the 2015 Disney hit, "Moana." They’re joined in the cast by a large set of newcomers, who play most of the core student roles. The co-creator and showrunner is Jason Katims, the man behind past powerhouse NBC dramas like "Friday Night Lights" and "Parenthood." The producer and co-creator is Jeffrey Seller, the major producing force behind "Hamilton," and he’s even brought Lin-Manuel Miranda in to write at least one song. The first season’s plot centers on the popular 2006 Broadway musical "Spring Awakening," and will include that show’s acclaimed score. "Rise" was filmed mostly in Brooklyn and White Plains, N.Y., and is set in a fictional, blue-collar Pennsylvania town called Stanton. Like "Glee" before it, "Rise" seems geared towards those who love musical theater, as well as those interested in stories of high school misfits and outcasts, sometimes (but certainly not always) of the LGBTQ persuasion. "Glee," in its early days, also featured a plot about a star football player encouraged to take up the performing arts. With the show introduced at the Television Critics Association press tour earlier this month, "Rise" has found itself the subject of an unlikely controversy, with objections have been raised to one particular creative decision: That the teacher character on the show, played by Radnor, is a straight family man, whereas the real-life Volpe, as depicted in the book, was long closeted before coming out as gay later in life. The creative forces behind the series, led by Katims, have mostly defended the decision by stating that the characters on the show are based only loosely on their real-life counterparts, and that besides, the series also tells multiple stories involving LGBTQ youth, including the portrayal of a transgender male student character. "Spring Awakening," meanwhile, is an often-controversial musical that dives headlong into teen sexuality, including homosexuality. Sokolove, who grew up in Levittown, is now a New York Times Magazine contributing writer and has written three other books, including a biography of disgraced baseball legend Pete Rose. He’s now at work on another book, about the college basketball recruiting scandals at the University of Louisville. Sokolove was very clear that while his book is the source material of the series, he has no active involvement in its production. “I think [the show] is very good and I'm proud to be associated with [it], but it is Jason Katims' and NBC's creative effort rather than mine,” Sokolove said. Sokolove wrote Drama High: The Incredible True Story of a Brilliant Teacher, a Struggling Town, and the Magic of Theater, which came out in 2013, about Volpe, who had been the author’s teacher and mentor when he attended the school. It was then known as Woodrow Wilson High School. “I had thought for many years about writing about [Volpe], because the book is not just a love letter to a teacher, it’s sort of an intense, two-and-a-half-year project in which I went back there and observed this remarkable teacher and this remarkable program,” he said. Sokolove credited his wife Ann Gerhart, a Washington Post editor and “my editor for life,” with encouraging him to finally pursue the book. I think it’s one of the worst aspects of where we’re at right now in life that people feel very free to condemn things that they haven’t seen." He said the book was optioned shortly after its publication, but really took a step towards fruition when producer Seller, who The New York Times has described as “The CEO of Hamilton, Inc.,” became involved. As for the controversy about the depiction of the teacher character, Sokolove defended the show. “Jason Katims created a show that was inspired by this book,” Sokolove said. Indeed, Josh Radnor is not literally playing Lou Volpe; the character is named Lou Mazzuchelli. In addition to the difference in sexual identity, the 43-year-old Radnor is also much younger than Volpe, who was in his late 60s when he retired from teaching in 2013. “[Katims] made his artistic choices, and if people want to question his artistic choices, I think that’s perfectly fine, but I do think they should watch it first,” Sokolove said. Katims has implied in interviews that making the character a family man with children will give Katims opportunities to use his own life for inspiration, something he’s done on his past shows, most notably with the character of the teenaged son with Asperger’s on "Parenthood." The same showrunner also created and ran "Friday Night Lights," another series based on a book by a Philadelphia author (Buzz Bissinger) that also got pretty far away from what was provided by the source material. But if the trailer is any indication, if nothing else, "Rise" will likely make heavy use of Katims’ go-to writing move of an adult giving a young person an inspirational pep talk 10 minutes from the end of each episode. "Rise" debuts on NBC on Tuesday, March 13.